You will earn 938 Reward Points. Earn 1 reward point for every 1 dollar spent. The Infra-Black foodwarmer is designed to be used in applications where the vertical distance from the warmer to the food sitting on a metallic surface is between 4" and 14" (102-356 mm). The emitter provides a very even and precisely controllable heat source that will operate at a wide range of temperatures, resulting in uniform food temperatures at close distances. Infra-Black Foodwarmers require a remote control box with toggle or infinite switches or an attached thermostatic control box. 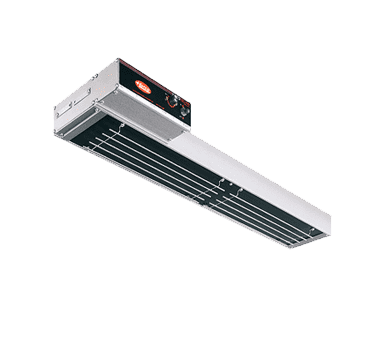 This allows the unit to be used with a variety of food types, operations, mounting heights between 4" to 10" (102-254 mm) with single units and 8" to 14" (203-356 mm) with dual models. The temperature of the emitter can be easily adjusted with the thermostatic control to accommodate changing conditions and food product. All models are available in Designer powdercoated colors of Warm Red, Black, Gray Granite, White Granite, Navy Blue, Hunter Green, and Antique Copper, or Gloss finishes of Gleaming Gold, Glossy Gray, Bold Black, Radiant Red, and Brilliant Blue. The powdercoated surfaces provide durability and are easy to clean. The flat black emitter provides even, precise controllable heat. Ideal for holding food safely with proper serving temperatures at close distances. The temperature is easily adjusted to accommodate changing conditions and food product. Optional coated shatter-resistant incandescent lights enhance brilliant product display while safeguarding food products from bulb breakage. Note: Relay required for 120V 42"-72" (1067-1829 mm) and 208V 72" (1829 mm) models.